Hello people, first of all I just want to tell you that the very talented singer Amy Winehouse was found dead at her apartment in London yesterday. Suspected because of drugs overdose. She's only 27 years old which means that she will be the newest member of Club 27. I must say that I'm quite shocked by this news, everybody knows that she had problem with drugs, alcohol, her lifestyle is unhealthy, etc etc but I'd never expected her to gone this soon. I first heard her song 'Back to Black' when I'm in the seventh grade and I was instantly in love with her voice, it's strong, powerful, heavy and unique. Then I started to google her and the first thing came into my mind is 'She is cool'. Yeah, I think she is cool, disregarding all those mischief she did, her tattoos, her sometimes awful performance and her wonderful hairdo which some found ridiculous, she is always cool in my opinion. I categorised Amy neither as good nor bad, she is humane, a human living who sometimes did some wrongs and some right. Now that she is gone, let us all pay tributes and homage to her, she must had struggled a lot during her lifetime. RIP Amy Winehouse. Anyway, sorry for my spamming on the twitter's timeline by RTing tweets about Amy's death. This is the first time someone I like a lot is dead. 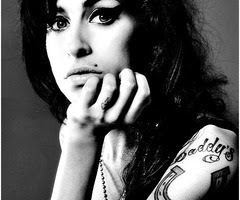 Again, RIP Amy Jade Winehouse, the singer-sonwriter and one of the beauty that I've ever seen, I love you.